Nu Ja was born with limb differences in her arms and legs, meaning they are either absent or incomplete; however, this rarely slows her down. “Kristi, get!” 9-year-old Nu Ja excitedly tells her new assistance dog. With a wagging tail, assistance dog Kristi retrieves Nu Ja’s lunchbox from the kitchen counter and then carries it down the hall so Nu Ja can put her lunch in her book bag. 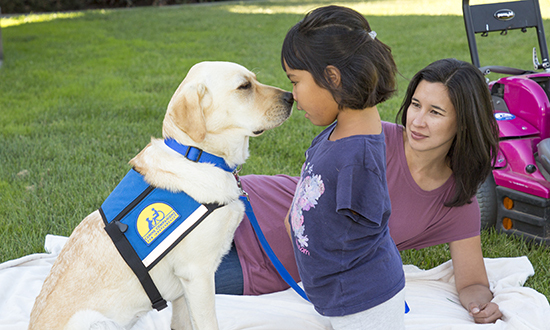 As an expertly-trained assistance dog, Kristi performs commands that help Nu Ja be more independent every day. Over the years, Nu Ja’s parents had discussed getting an assistance dog. They learned that costs could be high and wait times lengthy. After moving to Northern California, Nu Ja’s mom, Jessica, met a gentleman and his Canine Companions service dog at a park. After talking with him and learning more about Canine Companions, they applied for a dog. Nu Ja was matched with Skilled Companion Kristi in September 2018. Skilled Companion teams are three-part teams: the recipient, the canine and an adult, typically a parent or guardian, who facilitates the handling process, manages team safety and ensures the dog's daily needs are met.